The Jackson Lodge in scenic Amador County California features twenty-eight spacious hotel rooms and eight private cabins with a choice of several bed configurations ranging from one double bed to two queens plus one double. Our accessible rooms are equipped with shower-tub combinations, as well as roll-in showers and a host of accessible features. For groups, vacation travelers, and larger families, we also have several sets of connecting rooms. All of our beautiful cabins feature a full-size living room, a fully equipped kitchen, a bedroom, and a private bathroom. All bedrooms have king size beds, and each living room is fitted with a queen size sleeper sofa. Additionally, our deluxe cabin features a fireplace and hardwood floors and is ideal for families, special occasions or more privacy. All cabins have separate outdoor patios to relax. Our spacious lodging, cottages, vacation rentals, and single bedroom cabins are perfect for gatherings and families exploring the Sierra Nevada foothills and the California Gold Country. If your room is available before our check-in time of 3 PM, we are happy to provide early check-in. A late check-out fee of USD 10 per hour, up to the cost of an additional night’s stay. ON WEEKENDS, we have a 48-Hour Cancellation Policy. If you wish to cancel or modify a reservation, you must do so by 3 PM 48-hours or 2 days prior to your arrival date. ON WEEKDAYS, we have a 24-hour cancellation policy, and guests must call 24-hours or 1 day prior to the arrival date. ON HOLIDAYS and special events, longer cancellation periods may apply. If you cancel or modify post the expiration of the Cancellation Period or you fail to show up, a no-show charge will be levied on your credit card for one full night plus tax. Early departures are considered last-minute cancellations and are non-refundable. Holidays & special events are subject to seasonal rates. Non-refundable reservations cannot be canceled or modified - total reservation amount will be charged in case of cancellation or no-show. With AAA reservations, guests must show proof of enrollment with AAA services in order to receive an AAA discounted room. LATE ARRIVAL: If you will be arriving at 10 PM or later, please give the hotel advance notice for instructions on picking up your room key. 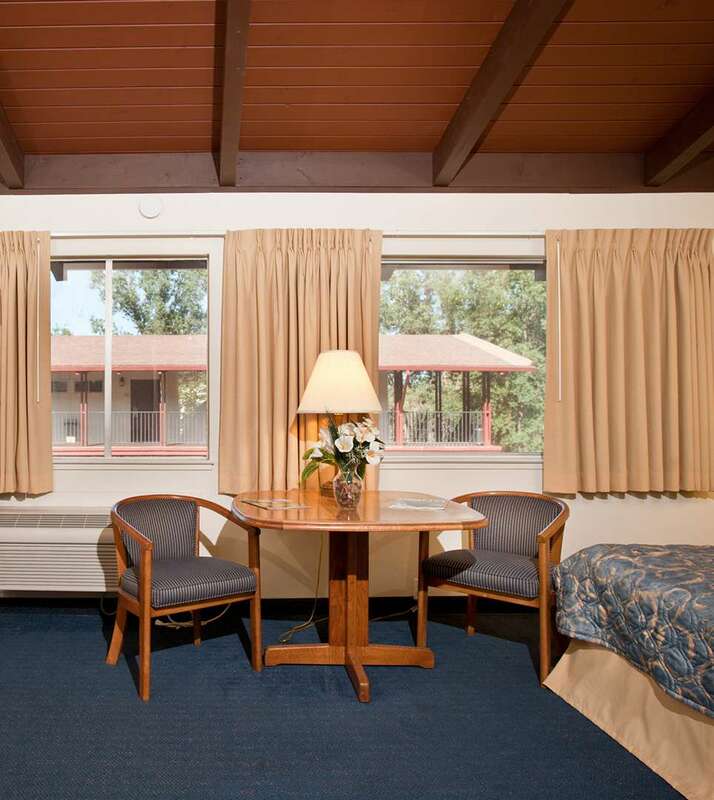 The Jackson Lodge is located at 850 North Highway 49 in Jackson, California. Our central location provides easy access to Kirkwood Ski Resort, the Jackson Rancheria Casino Resort, and local area attractions. Additionally, we are a three-hour drive from Yosemite National Park, South Lake Tahoe, and Carson City, Nevada. The Jackson Lodge is 100% smoke-free and pet-friendly. We provide comforts like complimentary WiFi, complimentary self-parking, and complimentary continental breakfast. Up to two (2) children 12 years old and younger stay free when staying with one or more paying adults. ADA Defined Service Animals are welcome at our hotel. Our hotel is also pet-friendly. To ensure the comfort of all guests, dogs that are small to medium sized are permitted in pet specific rooms only for a fee of USD 15 per pet, per night. We allow a maximum of two pets per room. A refundable deposit of USD 125 is required. No other pets are accepted. Unauthorized pets or pets in non-pet rooms will incur a fee of USD 125 per night, and expulsion from the premises upon discovery.